The same official curricula that CFA Program candidates receive with program registration is now publicly available for purchase. 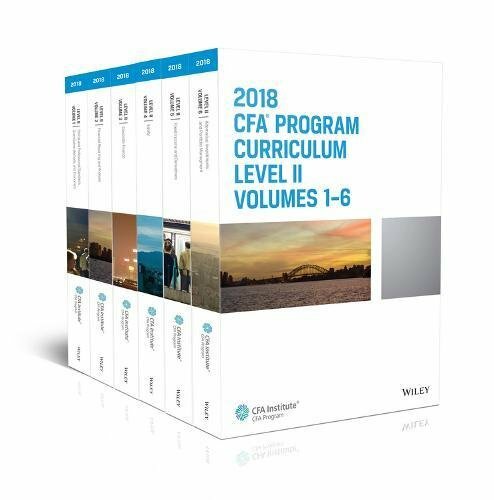 CFA Program Curriculum 2018 Level II, Volumes 1-6 provides the complete Level II Curriculum for the 2018 exam, with practical instruction on the Candidate Body of Knowledge (CBOK) and how it is applied, including expert guidance on incorporating concepts into practice. Level II focuses on complex analysis with an emphasis on asset valuation, and is designed to help you use investment concepts appropriately in situations analysts commonly face. Coverage includes ethical and professional standards, quantitative analysis, economics, financial reporting and analysis, corporate finance, equities, fixed income, derivatives, alternative investments, and portfolio management organized into individual study sessions with clearly defined Learning Outcome Statements. Charts, graphs, figures, diagrams, and financial statements illustrate complex concepts to facilitate retention, and practice questions with answers allow you to gauge your understanding while reinforcing important concepts. While Level I introduced you to basic foundational investment skills, Level II requires more complex techniques and a strong grasp of valuation methods. This set dives deep into practical application, explaining complex topics to help you understand and retain critical concepts and processes. CFA Institute promotes the highest standards of ethics, education, and professional excellence among investment professionals. The CFA Program Curriculum guides you through the breadth of knowledge required to uphold these standards. The three levels of the program build on each other. Level I provides foundational knowledge and teaches the use of investment tools; Level II focuses on application of concepts and analysis, particularly in the valuation of assets; and Level III builds toward synthesis across topics with an emphasis on portfolio management.